The last of the sun glints through the lime tree canopy and lights up the straw-coloured Riesling in our glasses. There’s a parade past our bench on the cobblestones of Simon-Dach Strasse – a procession of defiantly liberal weirdness, no two people alike, as if each person belongs to their own tribe: A nut brown man in an Alpine hat and peculiar shorts, girls in meticulously studied scruffiness, an elaborately tattooed man in a short sleeved linen shirt with suit lapels, an angular faced woman, pale and wearing clownish tights. 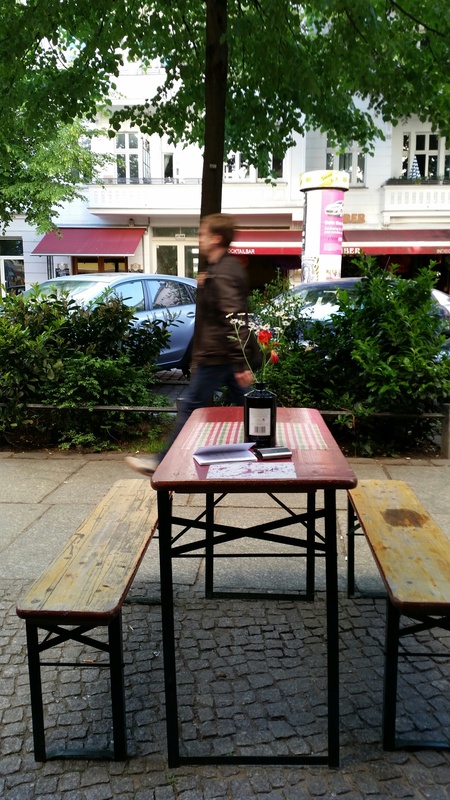 Tipsy on our Riesling, we wonder if the defiance of authority here – the graffiti, the public urinating, the ostentatious beer drinking on the trains – is a reaction to the city’s past oppressions. But what do we know? Yesterday on a train I eavesdropped on two American boys, hotel management students, cranking up their campness. “I hate America,” one of them said, overdoing things a bit, perhaps wanting too hard to be a piece of Berlin. On the way back to our flat, the same ginger bearded rapper is pounding out poetry at the Warschauer Strasse U-Bahn. It’s seven in the evening and the hordes, the tribe of tribes, flow out of the U-Bahn, pressing against us in the rush to join the parade in Simon-Dach Strasse.